MOst of functional materials, the properties can be controlled by doping small aount of foreign elements. Typical case is Si semiconductor, in which very small amount of B or P is deped to change the performance as a semiconductor. We are investigating the effeects of doping to atomic structure and properites by observation of local atomic structures. FOr local atomic structures, in particular, local structures of light elemets, we are developeing the world-first technique, white neutron holography in J-pARC. This method can visualise local atomic structures around dopants, which exist only around the dopants. 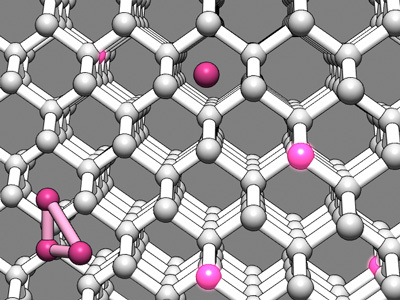 Crystal Structure of Si, which is the same as that of DIamond. Large single crystal of Si for neutron holography experiments. 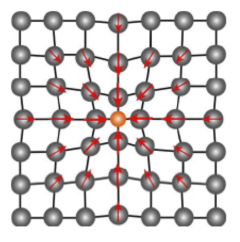 As investigations of Basic solid state physics, we are invesitgation of magnetic properties of rare earth strongly correlated electrons system using neutron scattering technique.